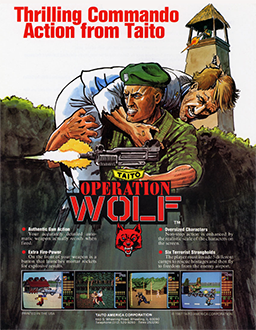 Operation Wolf is a game I can’t help but associate with Pizza Hut. Taito’s introduction and unique take on the light gun shooter flooded the American franchise so much in the late 80s that I can think of no other place I’ve actually played the game. Of course being a pizza franchise and not an arcade the difficulty was always cranked to the highest and I swear they timed the machine to play approximately half the time it took to cook a pizza so that families with two kids would each play one credit before the food was ready. 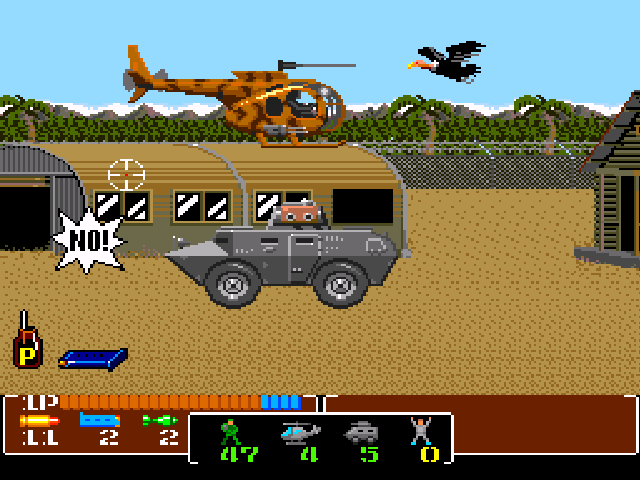 This title brought more realism to the light gun shooter as you play a member of special forces diving behind enemy lines in Cuba to extract five hostages. 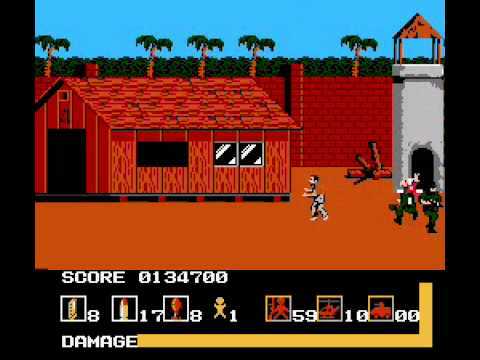 Aside from the realistic violence of invading and destroying enemy encampments, this was the first light gun shooter to feature a plot and natural progression as well as a moving, scrolling stage instead of a fixed location. Did I mention it was addicting too? Mind you, we are still back in 1987, where arcade games were more about providing a specialized challenge with amazing graphics instead of explicitly drinking as many quarters as you’ll offer. The cabinet had a large mounted Uzi machine gun that could only swivel slightly with forced feedback to emulate gunfire kickback, pretty nifty for games of that time. At first glance it seems like a spray & pray title, but as you run out of ammo, die, and get captured you begin to realize you might need a slight bit of strategy. If you die, even if you have another quarter in the machine, you will still need to complete the current level from scratch (although you will now have full ammo and life). Innocent people are thrown into the mix, which you should not shoot, and animals, which you should shoot, for bonus items. Early on there’s not much penalty (as I prove in the video below) for blasting civilians or missing a vulture flying overhead, but by the final levels your screen will have a literal 50/50 spread of civilians and enemies with these animals being mostly your only source of ammo and power. I only do one playthrough in the video, but in truth I replayed this game for a couple of hours of fun. Unlike other light gun shooters before it, this game was less about accuracy and more used the gun as a placeholder for an invisible reticule. This is why most home ports and conversions don’t suffer from controller porting and in truth this type of game has proven to be just as effective, if not more so, with a reticule and controller as opposed to a light gun (which I cover in the home ports below). 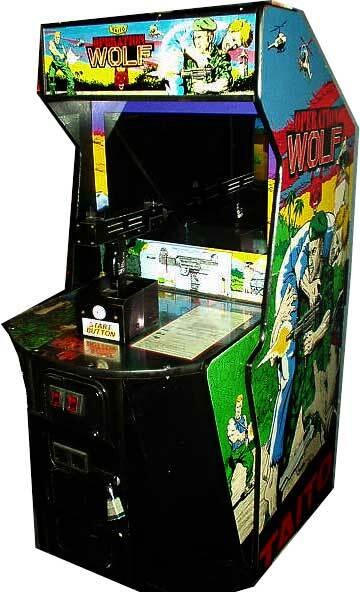 Operation Wolf was the next step in interactive game design at the arcades and had everything a kid looked for when plunking down 25-50 cents: a big cabinet with flashy accessories, lots of explosions, and even catchy music that anyone who’s played the game will recognize. It also gave way to a new type of light gun shooter that will later be used with some of my favorites like T2: The Arcade Game, Revolution X, and even the more recent Resident Evil Chronicles series on Wii and PS3. Operation Wolf was released all over the place, and I mean that from a worldwide perspective as well as the number of consoles that received a port. There was, of course, an NES version that did what it could to bring the action home but aside from a visual downgrade the fact that only three enemies could be on a screen at once made the game feel rather vacant. You can use the Zapper in this version, but with the intended design for single bullets the change to automatic firing meant all you’d hear was the constant clicking of the Zapper’s trigger (although the heavy reduction of enemies seemed to balance this out). It got a little better on the Sega Master System, where this console definitely had more popularity in Europe than America. 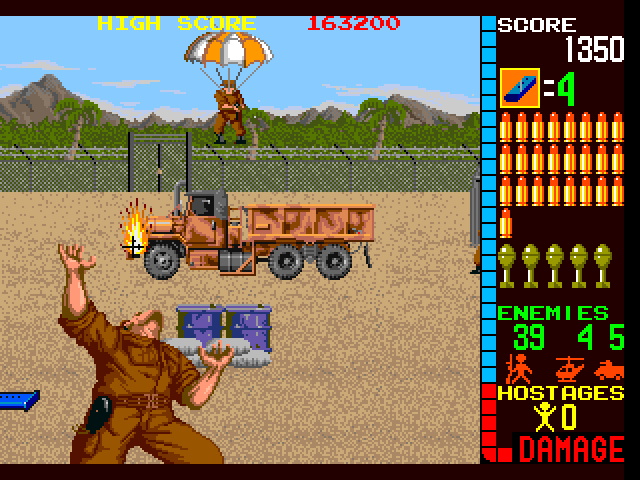 Graphics were improved slightly, more characters could appear on the screen, and even Light Phaser support, which had a much quieter click to the shooting of the trigger, but as with the NES version there’s a distracting amount of flicker and visual oddities when playing the game with a gun. Mind you, both of these versions improve slightly when you use the controller but in today’s market you can find much better ports for the same price. The US version on NES was ported to the Wii, but for whatever reason you can only use the controller and all light gun (or WiiMote) support is stripped, as with all other ported light gun games on the Virtual Console. It was also ported to tons of microcomputers, also a European staple of the times, including the Amiga, Amstrad CPC, ZX Spectrum, Commodore 64, Atari ST, MSX, and even DOS. Aside from the DOS port, all of these versions looked incredibly similar depending on the era (C64/MSX vs. Amiga/ZX Spectrum). I’m sure there’s a European retro gaming site that is battling it out over which version had the better synth sound but I have little access to actual hardware of these titles and even littler interest in comparing the nitty gritty of each. With these versions your biggest problem is the lack of colors and the stuttered scrolling, which claims responsibility for most of my gripes with microcomputer ports. Still, the soundtrack is noticeably better than the 8-bit console ports and graphically the games are on par. You can use Magnum Light Phaser, which to me looked identical to the Master System Phaser, on the ZX Spectrum version with the same issues as any other light gun version of this game, but for the most part it’s all keyboard or controller. The DOS version sounds terrible but looks close enough to the arcade to be notable, I think it also features mouse support, but either way it’s a decent port. Finally there is the PC-Engine (Japanese Turbografx-16) version that stripped two levels, allowed you to select which level you wanted to play, and removed almost all game music. Graphically it looks nearly perfect, the game runs super smooth and seems to have no problem with many large sprites on screen, and with the built-in turbo on the gamepad it’s a great way to enjoy the game. Unfortunately I do feel there’s much lost to the plot and progression aspect of this game when you remove the mission structure and with no background music there are some eerily quiet times. I bought Taito Legends 2 at a thrift store for $2, still works great on Windows 7 x64, very good compilation, emulation has no problems, and supports keyboard and joystick with global and per-game remapping. The only minus is the low-quality flyer artwork.